First balsa shipment late 1957. Bodyboard timber and fibreglass adaptation of paipo with more flotation. Miminal scoop, often twin fin. D: 4 ft 6” x 22” In Victoria these boards were sometimes called a Lamaroo. Reprinted in Nat History, 1983, page 89. 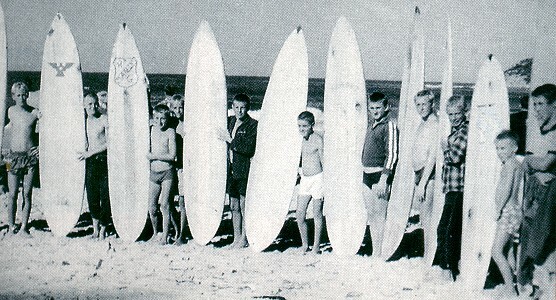 "1958 , John and family friend Barry stark collect their first custom boards from Bill Clymer. Duke Kahanamoku Another visit to Australia, documented in a newsreel item 'Duke Kahanamoku : the man Who Gave Us the Surfboard', (Cinesound Review 1410, 1958). Bob McTavish Pods for Primates Part 1 Tracks1972. 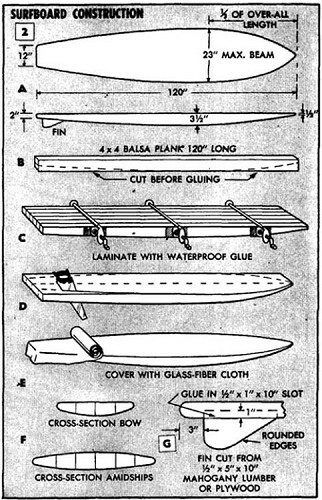 Balsa and Fibreglass Surfboard Construction, 1958. The carefree, playfree, Berlie Sarong Pus, 1959. At the start of the season a visit to the area by members of the South Bondi Boardriders Club [many of whom were members of the Bondi SLSC], was to have ramifications to the local area. 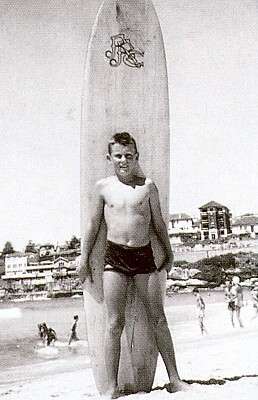 Some members of the Mollymook SLSC had at the end of 1960, locally pioneered surf board riding, using malibus. They had been able to combine both surfing and surf lifesaving without any problems. Bob Evans, Ian Hunter, Bob Davidson, Peter Williams and Ivan Johnson were the first, and many of the younger club members over the next few seasons followed on. The visit of the surfers from other areas like Bondi on 'surfaris' seeking out new, unspoiled waves, introduced the youth to a new culture that did not include surf lifesaving in the equation. Basically it meant a competition in coastal areas for the pool of local youth which has continued on ever since. 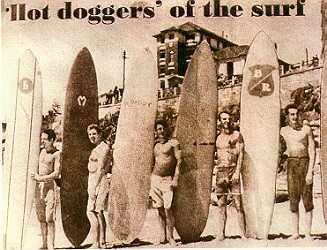 Photograph: The first boardriders. From Left Ivan Johnson, Bob Evans and Ian Hunter. - Johnson: Mollymook SLSC (2010) page 32. Photograph: 1962-1963 Bob Cairns, club member posing in his 'neck to knee' costume (and balsa pig board). - Johnson: Mollymook SLSC (2010) page 25. Second left : Possibly Bluey Mayes.